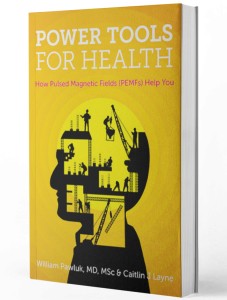 How do PEMFs help improve blood flow? I have previously stated that almost all magnetic fields, static and PEMF, stimulate circulation. Within certain limits, almost any magnetic field intensity will increase circulation. Improvements in circulation are not the limited domain of any single magnetic therapy device. In fact, I came across a study done in Korea using a high intensity 2.5 Tesla coil. The coil was kept away from the body so that it would not touch the skin. The actual measured intensity at the skin was 7000 Gauss (0.7 T) PEMF at a pulse rate of 1 per second, applied for 10 minutes in healthy individuals, using their own limbs as controls. Thermography was used to detect the impact on circulation. Thermography is a standard scientific and clinical tool to assess circulation. When one part of the body is stimulated with PEMFs, other areas in the body also respond with improvements in circulation, although to a weaker extent. The surface of the human body, that is, the temperature of the skin, reflects the temperature of the deeper tissues in the area of stimulation, so that the temperature of the skin and the blood flow are proportional to each other. There are a number of mechanisms that cause blood vessels to open to improve circulation. These include the movement of ions, production of nitric oxide, among others, the cause blood vessels to dilate, improving circulation. This includes all sizes of blood vessels. When blood vessels dilate there is increased blood flow with increased oxygenation of tissues. Increase circulation is considered one of the primary benefits of PEMFs in helping to heal the body, reduce swelling and increase nutrients and immune factors to tissues. The images below clearly demonstrate a significant difference between the unstimulated and stimulated parts of the body. 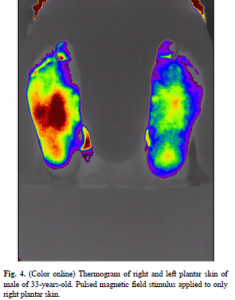 In figure 4 only the sole of the right foot was stimulated. In figure 5 the palms, knees and soles of the feet were each stimulated separately. The images on the left are before stimulation and the images on the right are after stimulation. From: Effect of Pulse Magnetic Field Stimulus on Blood Flow using Digital Infrared Thermal Imaging. Lee Hyun Sook. J Korean Magnetics Society, October 2011, 21 (5), 180-184.